Design and technical support teams are dedicated to work closely with architects and fabricators, in order to achieve the best qualitative installation for all kind of buildings. TECHNAL has the capabilities to respond to individual project needs through customised designs for specific schemes, performance enhancements and new innovations. TECHNAL strives to build a close relationship with architects to assist them in specifying TECHNAL products. Technal is establishing a network of fabricators and installers, ensuring consistently high quality standards for all products. 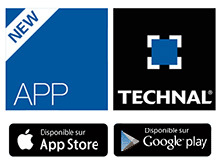 TECHNAL recommends the TechDesign quotation software for its customers. TechDesign is an essential aid to creative designs and drawings, as well as to professional tender documents. It helps customers to calculate precisely all types of constructions for aluminium joineries, curtain-walling, balustrade, partitions: quotations, studies, DXF cross-sections, etc.